Yellow gold is back on trend but we argue it never went away to begin with. Classic, warm and bright, yellow gold jewelry makes a statement and is a favorite for rings, bracelets, necklaces and earrings alike! Bonus: yellow gold is the most hypoallergenic gold, and it is easier to clean than white or rose gold. Romantic yellow gold goes with everything. From two-tone styles to gemstones and diamonds, gold is as flexible as it is beautiful. Stars such as Halle Berry, Jessica Simpson and Jennifer Aniston have yellow gold engagement rings. Yellow gold works well for brides looking for a vintage-inspired look or a classic touch on a modern design. 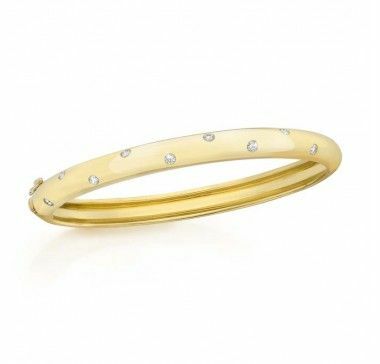 Pavé fancy yellow diamonds pop in this 18kt yellow gold eternity band.